I am a trained dancer and since an early age, movement and body awareness have been my passion. I was 35 when I got pregnant and became a mother. This event had a transformative and deep effect on my life and profession. 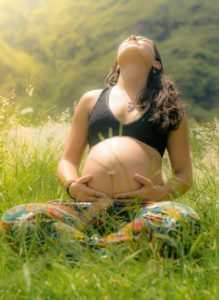 I was extremely privileged in that period to be able to attend a Somatic movement training in Body-Mind Centering® that changed my whole perception of what it means to be pregnant. I was living in London at that time and there were few choices for birth preparation other than Yoga, Hypno birth and some informative knowledge courses. I did all of those and I also had a great Doula to support me. It was all very useful but I was always a bit frustrated with not being able to move more freely than taking some Yoga classes. Also, I wished to have a deeper understanding of the transformation process of the body and the formation of the embryo than what I could find in books for the preparation of birth. Thanks to BMC and its experiential approach to the body and movement; I have connected with my body in a completely new way. It was a bit similar to taking a journey inside of my body, like as if I would look it up in an anatomical book and have the experience in my body at the same time. I have discovered and experienced the different systems of the body in myself, how they are all interconnected and working together to maintain a healthy balance. This process gave my pregnancy an all-new meaning. I remember some week-long courses moving and studying the ligaments that in pregnancy have a very important role; and finding the springiness and elasticity qualities in my body, or exploring some embryology principle combined with the embodiment of organs and the Endocrine systems that are supporting the all physical and hormonal changes in pregnancy. Then I became aware of my pelvis; the bony container and the inner soft content. As well as going through the main developmental patterns and the ontogenetic process of a child from conception to adult, I experienced them in my own body. I felt so privileged to be able to have this deeper experience. As soon as I got the Somatic Movement Educator qualification I felt I wanted to share this knowledge, inspire and empower other women in this process of change and embracing another being. 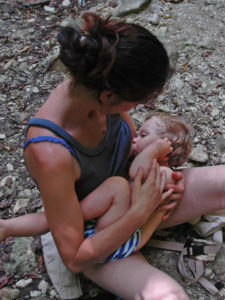 I would like to offer a different approach to pregnancy and motherhood. Even after giving birth there is so much happening for the first few years, outside and inside the bodies of the mother and the child. The bond between them is very special but sometimes overwhelming, and it is so important for a woman to re-find her centre and strength. For me, this was the most challenging part to face. Coming back to me, nourishing myself without getting totally lost in caring and nursing. For me BMC has been the link to my body and the deeper self and helped me to re-connect to life energy, to that vibration of enthusiasm and gratitude. Now it is my dream to bring this amazing work out there. And I like the fact that I do not feel I am the teacher; rather you become your own teacher, your body and the experience of exploring those BMC principles will show you your own personal way. Workshops for pregnant women in preparation for giving birth and becoming a mother. Can be taken in a group or as individual sessions. A series of classes/sessions that lead you into a journey through the changes of the pregnancy accompanying you in a somatic transformative movement exploration. The aim is to embrace you as a whole person (physical, emotional, psychological and spiritual) to help you tune in with your body and your baby and listen to your needs. I will provide you with body awareness and movement tools, based on experiential anatomy and embodiment somatic practice. We will practice integrating bodywork and nurturing gentle touch techniques to support your wellbeing process as well as guided visualization and somatization to promote a positive state of mind. The material is explored in the form of self-discovery and in respect of each body’s needs and abilities. It doesn’t require any previous experience in movement. The course will also be an opportunity to connect and share with other like-minded women and support each other in our feminine empowerment. I also offer on the side of the course, one-to-one Pre-Natal & Post-natal massage sessions, to integrate the process. As well as Belly painting to add a touch of fun to your pregnancy.